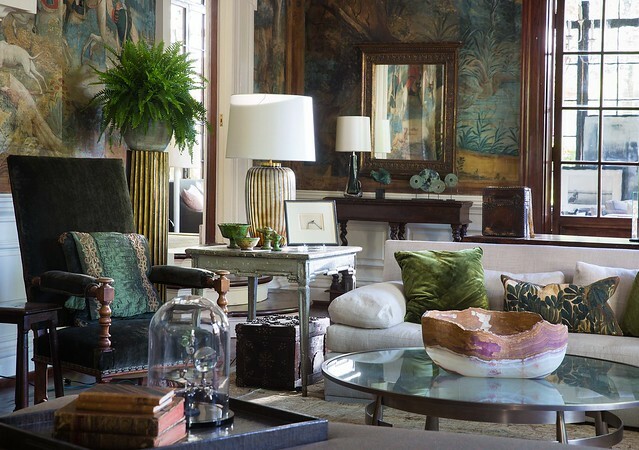 The buzz for the Atlanta Symphony (ASO) Show House began last year, when a Philip Shutze and Neel Reid designed Italian baroque style house on West Paces Ferry was selected as the 2014 Decorators' Show House. 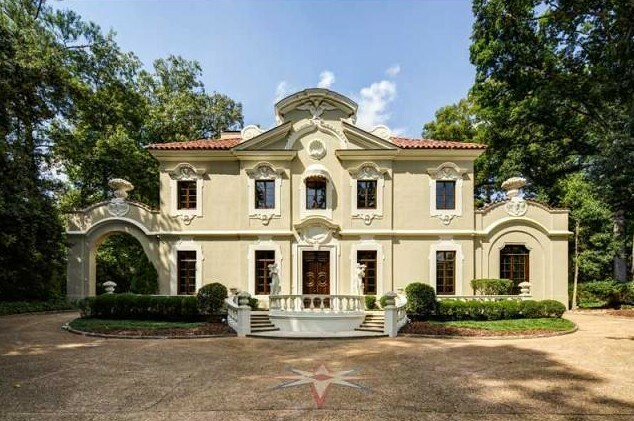 The house has a long and illustrious history, and was designed for a prominent Atlanta family in 1926. In recent years, the house has raised funds for many charities and has been used as a high end event venue. It has also been the ASO Show House several times before, in both 1979 and 2003, and was the Art House in 2009. The house is still called “The Pink Palace” as the stucco was originally pink, although the color is now a neutral sandy tone. The house has been on the market for quite a while; it is now listed at $7 Million, which is a large reduction in price from its $20 Million pre-real estate crash price tag in 2007. The real estate listing for this house can be seen here; it is listed by Keller Williams. I thought it would be interesting to look at some before and after pictures of some of a few of the rooms (and in some cases, the bare room compared to the decorated room) to see how the designers for the 2014 Show House have truly transformed the spaces. In this post, I’ll start with the Grand Salon. 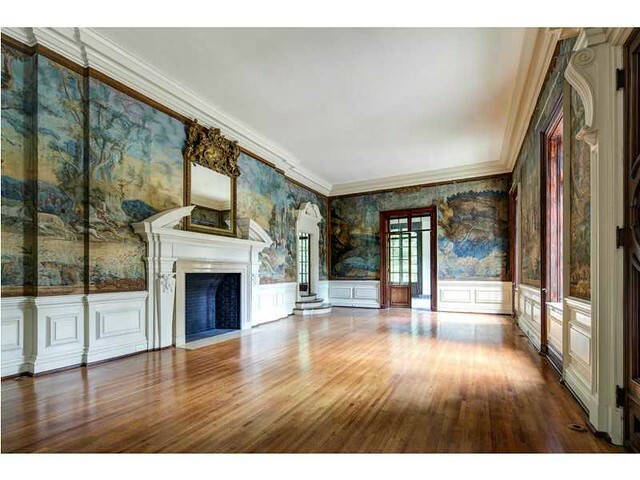 Before: Here is a picture of the Grand Salon from the real estate listing. This is a long room, with great architectural beauty. However, it is also a passage way to the solarium and the morning room, so careful consideration needed to be given to the arrangement of the furniture and the flow of the room. Note the hand painted linen that is on the walls – it is original to the house, and is quite beautiful. After: The Grand Salon by Westbrook Interiors, as pictured for the press kit for the Show House. 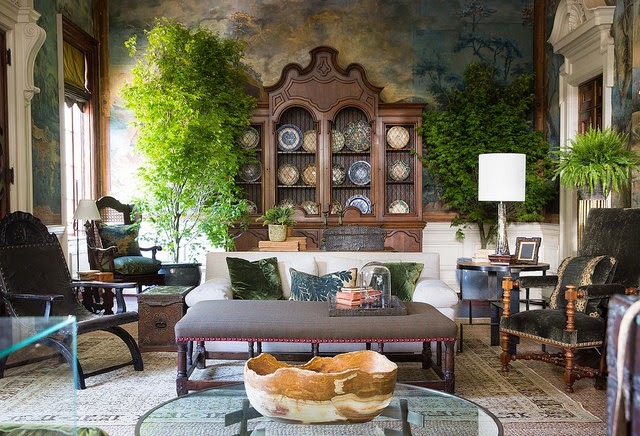 Designer Barbara Westbrook noted “The Grand Salon has the most amazing hand painted linen wallcovering, which is original to the house. You cannot ignore the rich palette of deep turquoise, blue, obsidian, and persimmon’'”. This room provided quite an introduction to the house. The colors are moody and rich, the furniture positioned for multiple uses. Photo credit Jeff Roffman. A view of the other side of the room. Part of the incredible feel of this room comes from experiencing it in real life. It is wonderfully layered and textured, with so many beautiful fabrics, colors, textures, and accessories. This is a sophisticated room decorated by a designer at the top of her game (bravo, Barbara Westbrook). 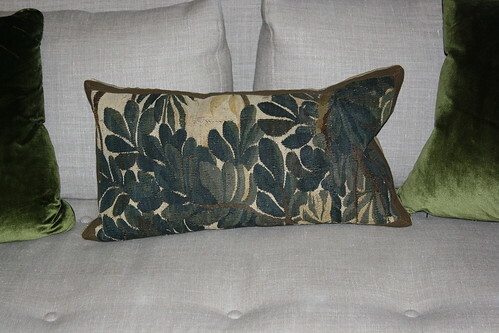 Horsley Kaufman pillow on the arm chair. Photo credit Jeff Roffman. 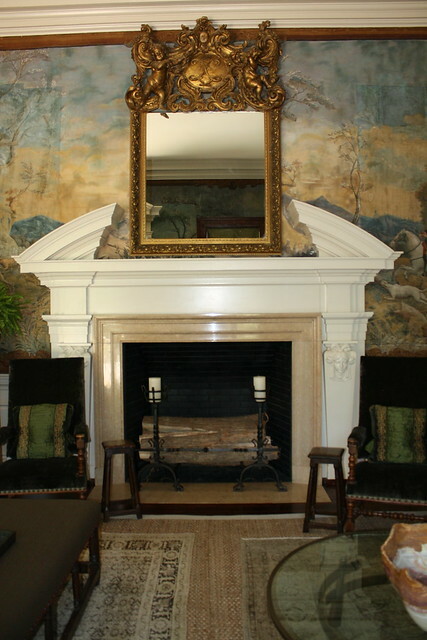 I snapped a picture of the mantel, which also shows the linen walls. I wish I had taken a picture of the full view of the room. 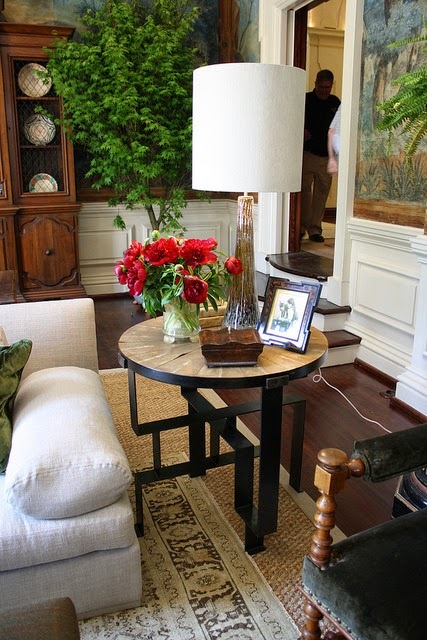 I was able to view the Show House on press preview day, and snapped a few vignettes. Please ignore the cords and backpacks that seem to be present in every shot! This table and table arrangement caught my eye. The lamp is absolutely beautiful. Although I generally don’t love tall drum shades, this one was perfect for the lamp and the space. A beautiful pillow looked like it was made for the room. 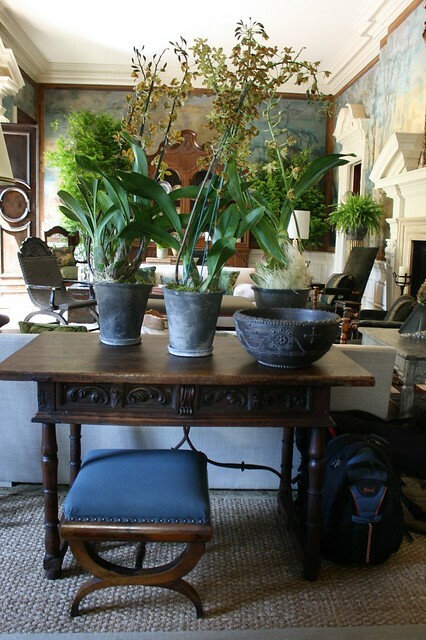 I loved this natural arrangement of orchids on the console/desk; the muted colors beautifully reflect some of the colors of the ancient linen wallcovering on the wall. Note the front door, which is seen in the upper left side of the picture. The entrance of the house puts visitors directly into the Grand Salon. Please ignore the duffel bag on the floor, it was not a prop! It was very busy in the Show House on media preview day, and there were many photographers around. 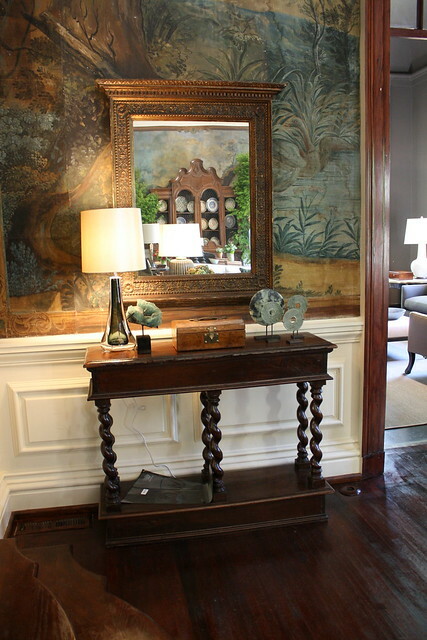 I was quite smitten with this Porta Romana lamp, as well as all of the accessories on this console. Note the shape of the stairs (on the bottom left) leading to the sunroom. It would be wonderful to walk through the house again and take in all of the architectural details. I hope you enjoyed this peek into the Grand Salon. There is truly nothing like experiencing a room in real life, so I highly recommend a visit to the Atlanta Symphony Decorators Show House! For more information on the Show House, please visit the web site. Tickets are $30, and can be purchased at the door. Note that there is no parking at the Show House, on the street, or in the surrounding neighborhood. Free parking has been donated by the Medici and Forum buildings; parking will be validated at the Ticket Desk at the Show House. Complimentary luxury shuttle service between the parking area and the Decorators’ Show House & Gardens is provided during normal operating hours. Parking is located on Northside Parkway just south of the intersection of West Paces Ferry Road in the Piazza at Paces building. WOW! That's unbelievably gorgeous! I just did a post on decorating with plants and I wish I had included this! I may need to link back to this! Hi Holly, I saw the show house yesterday.........the Grand Salon was truly magnificent! An absolutely beautiful transformation by Barbara Westbrook. So well worth seeing, every detail carefully curated! Holly the hand painted linen walls are truly priceless and well, it is a breathtaking home all around! Great post. You're right, Barbara Westbrook did a fantastic job on this designer house room. The effort that goes into one of these spaces is tremendous...and it looks amazing. Those handpainted linen roses are amazing! Thanks for sharing. Thanks Holly, we need every eye we can get. I imagined a wedding in there, then the wedding party. Pretty sure I'd break eventually break my neck on the handrail-less steps. You always get such good info about the history of the homes....I loved this room...it was so rich with gorgeous color.